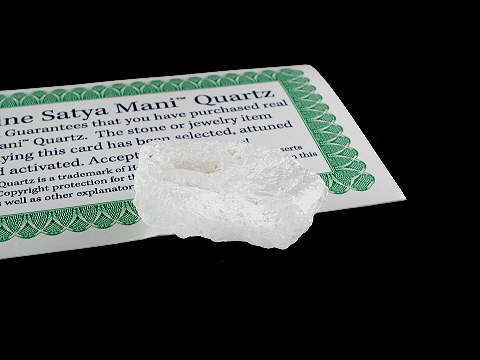 Genuine Satya Mani Quartz crystal from Southern India. Comes complete with authenticity card. One of the newly discovered, high vibrational crystals, Satya Mani Quartz is a natural crystal whose name means, 'Gem of Truth'. They bring one into conscious resonance with the truth of the heart. According to Heaven and Earth's description of this lovely new crystal find, they can help one to realise one's existence as soul and spirit and to attune to the inter-relatedness of all beings. The intensify the circuit of consciousness between the heart and high brain, or the third eye and crown chakras and they aid in development of one's powers of creative manifestation. They are stones of spiritual enlightenment and support one in bringing joy and pleasure into the world through the expression of love. A beautiful new crystal, indeed!